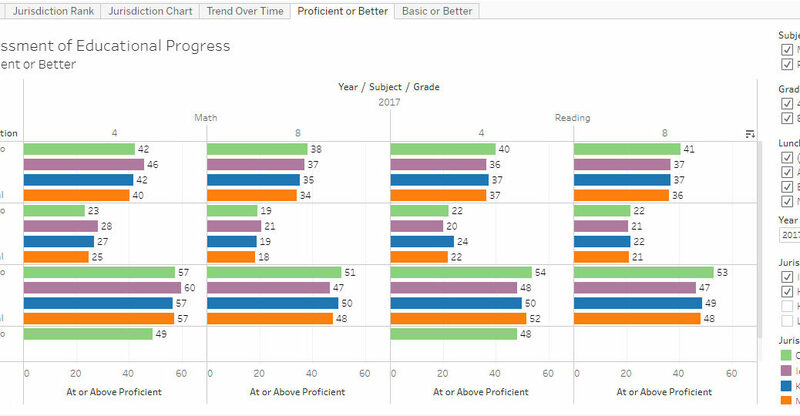 An interactive presentation of National Assessment of Educational Progress (NAEP) scores for the states, grouped by race/ethnicity, and then by lunch status. The NAEP tests are administered at several grade levels and for a variety of subjects, but the primary focus is on math and reading, at grades four and eight. I’ve gathered test scores from NCES several test years, for these two subjects and two grade levels, with the results available by race/ethnicity in one visualization, and by lunch eligibility in another. Eligibility for the school lunch program is used as a proxy for household income, with “eligible” meaning the student is from a low-income household. For the visualization based on race/ethnicity, click here. For the visualization based on school lunch status, click here. Example visualization. Click for larger.